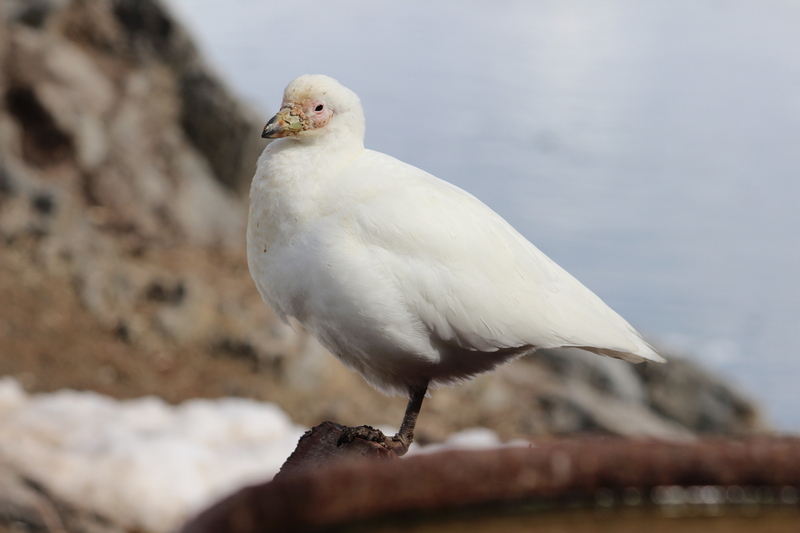 I saw this Larus dominicanus on my trip to Antarctica. The species is threatened by marine oil spills and suffers mortality from interactions with trawler warp cables (http://www.iucnredlist.org/details/22694329/0). 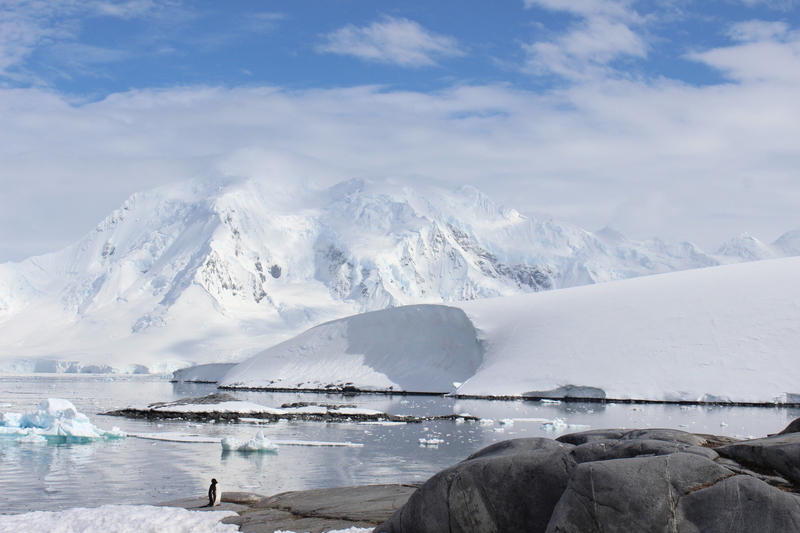 Chionis albus is the only non-penguin land bird native to Antarctica. 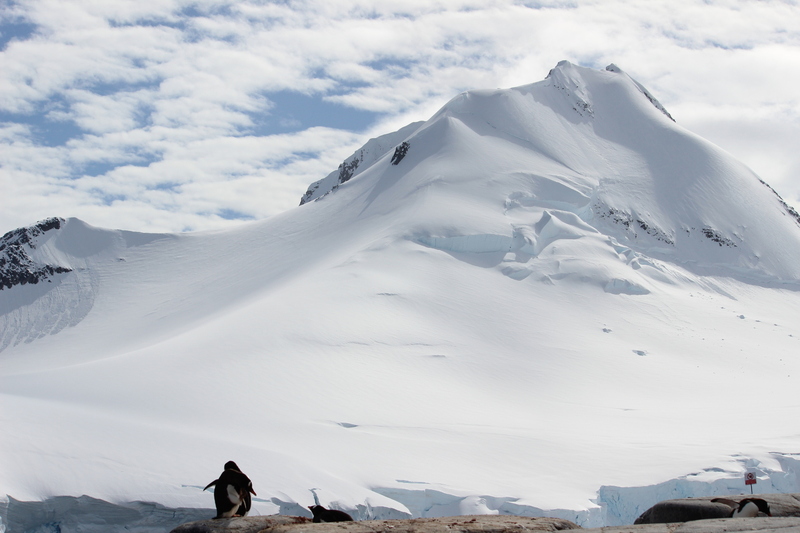 I took this photo near the ‘penguin post office’ in Port Lockroy. 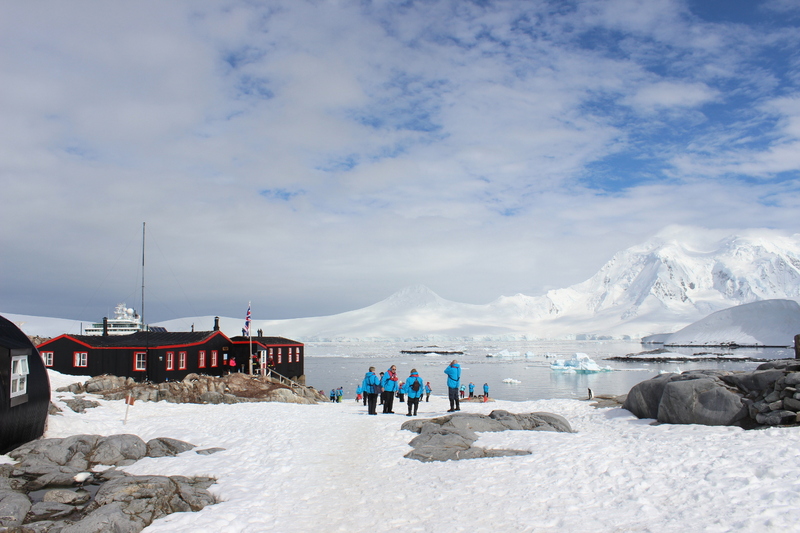 Port Lockroy – British history 64° south. If you are interested, their website is great: http://www.ukaht.org/. It’s a magnificent place to be, especially in sunshine. 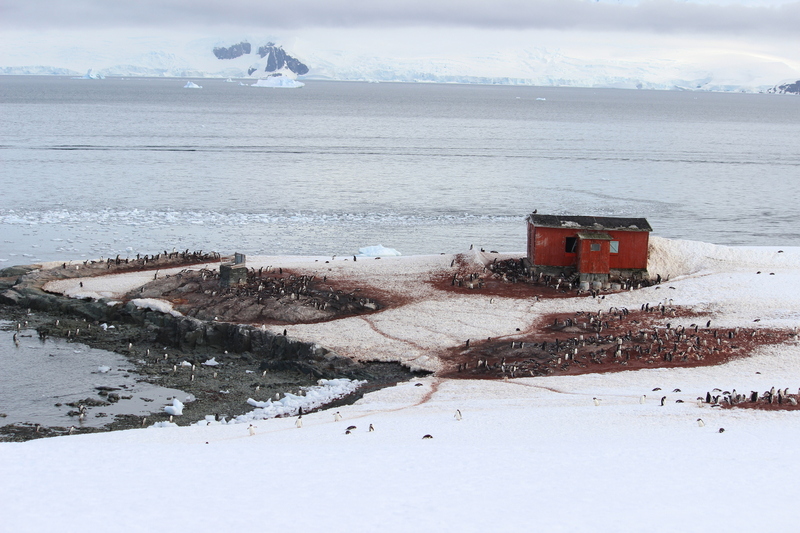 The tiny island where it is located is also home to a Gentoo colony, and yes, part of the Zooniverse project http://www.penguinwatch.org/. 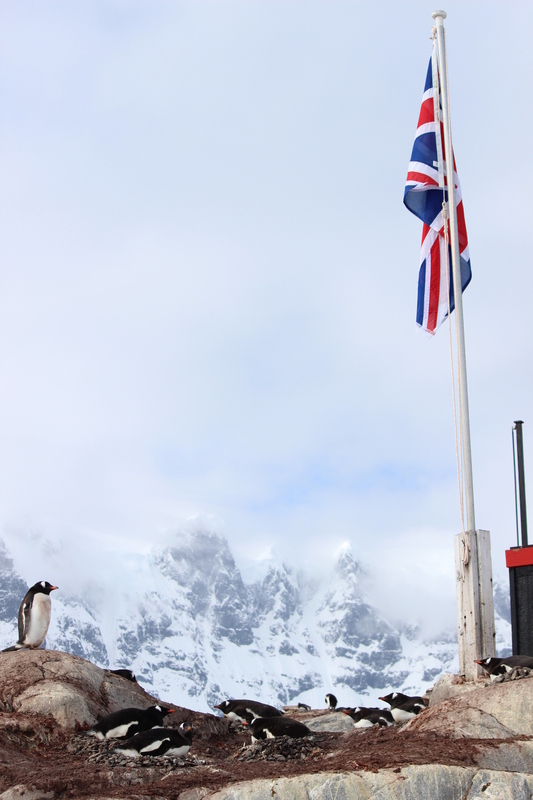 The BBC made, helped by the people who work at the UK’s southernmost post office, a film about the place, aptly called ‘Penguin Post Office’. Watch it! The penguins have one addition here to their life. They can, and sometimes do, stand to attention. Or they just get on with pebbles and breeding. It was really a gorgeous day, so we spent only a few minutes inside the quirky museum. Life as it used to be here, one of the people working there even turned on the old gramophone, playing Frank Sinatra, I think. Not entirely my time or music, but it was great fun. 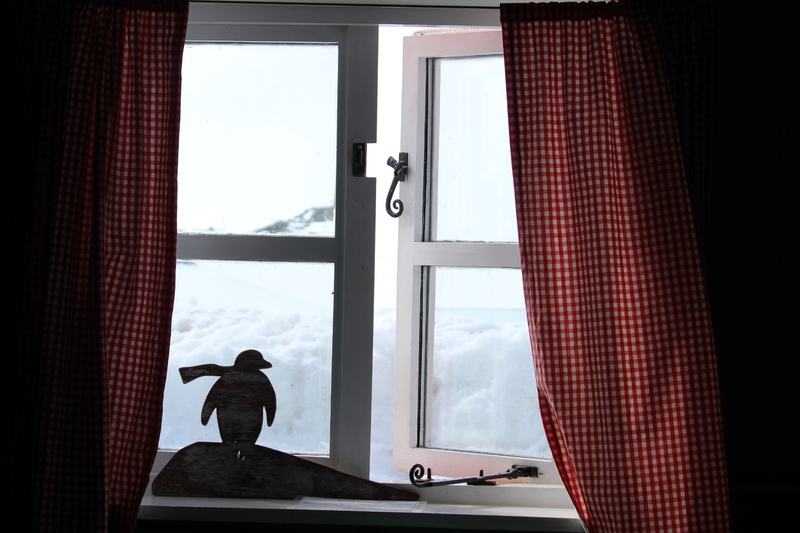 Again outside, we needed to be careful not to trip over the Snowy Sheathbills. 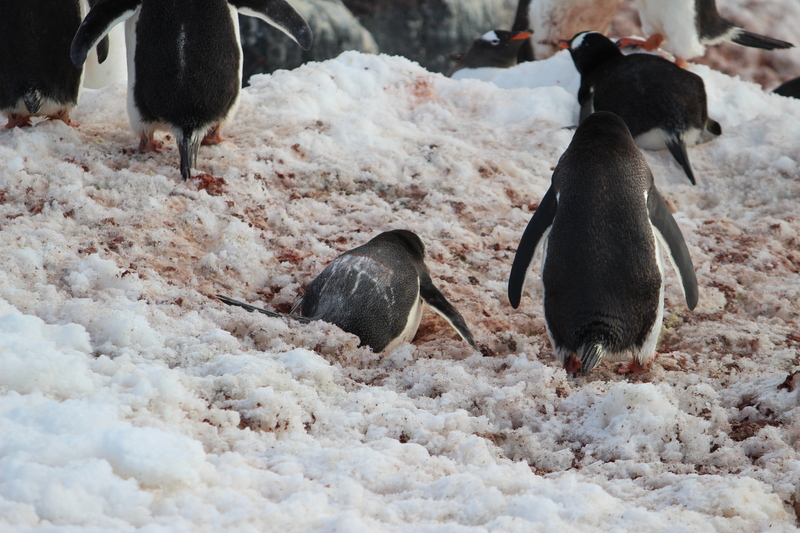 They were busy scavenging in the penguin poo. 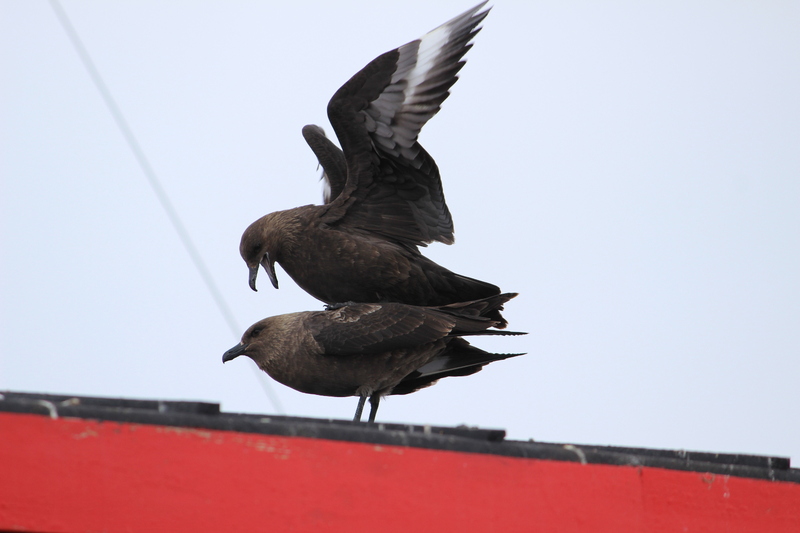 The Antarctic Skuas were trying to finish their acrobatic mating business, it looked successful. This must be the most wonderful post office to work in. I shall definitely keep that in mind as an option to come back here. 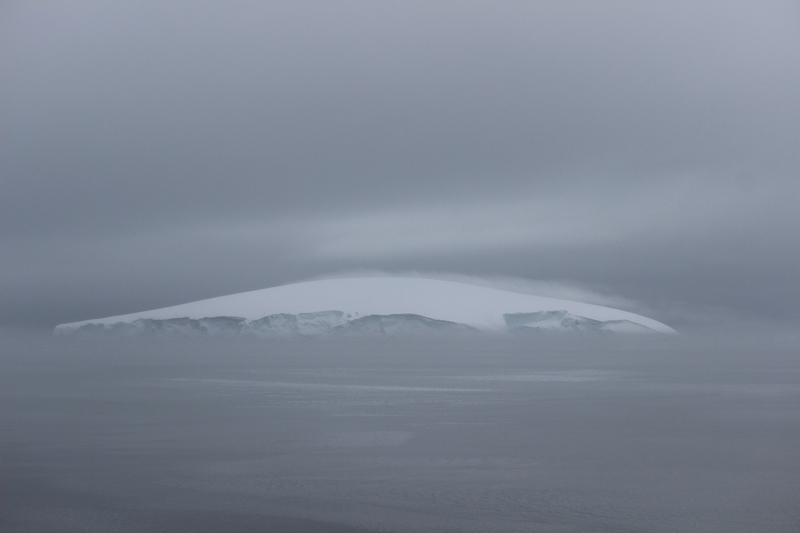 We had been cruising somewhere between the Antarctic Peninsula and Wiencke Island, when we hit ice. 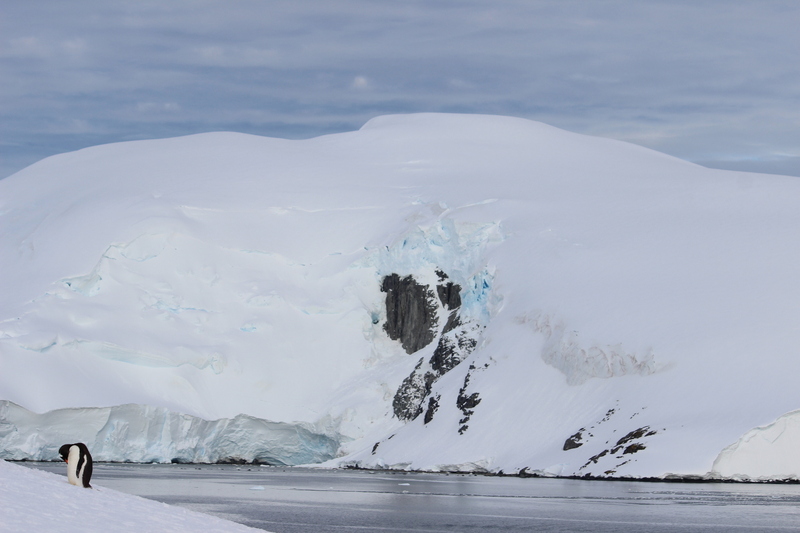 Its peculiar shape has led to its name, pancake ice. 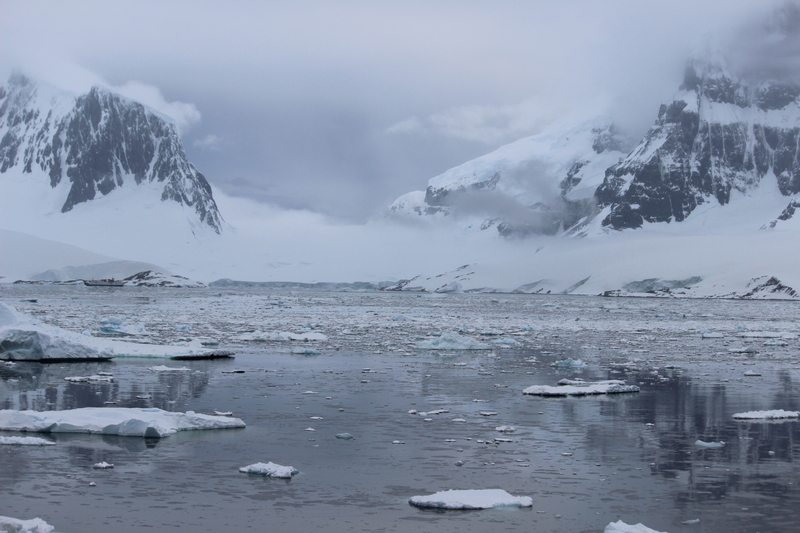 There was no continuous ice surface, just small floes and slush in between. The ship had also been built to deal with exactly this kind of condition. 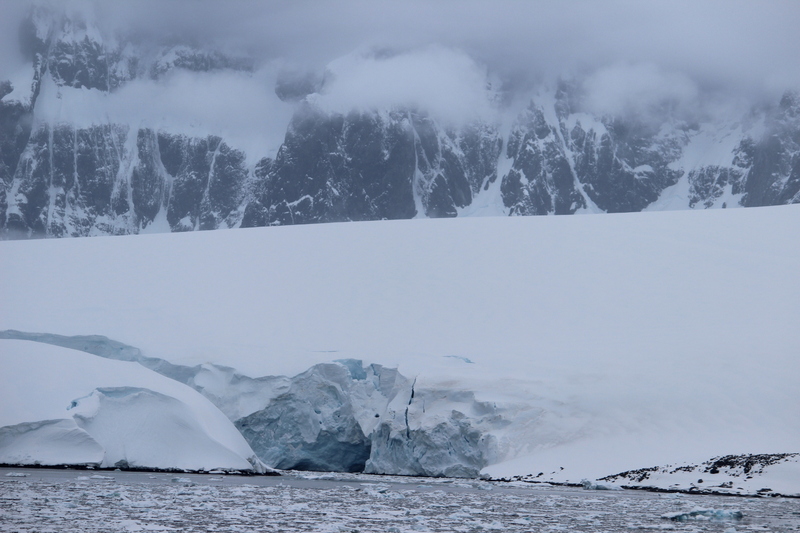 Every now and then we could hear a loud, low-pitch bang – must have been biggisher pieces of ice. 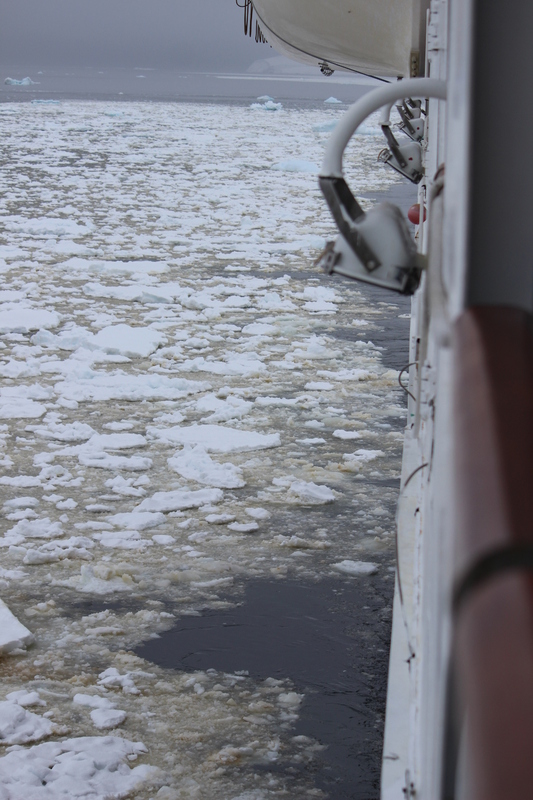 So we spent time on deck, watching the ice, when someone pointed out a penguin swimming close to the ship. This was in itself quite rare, they tend to swim away. 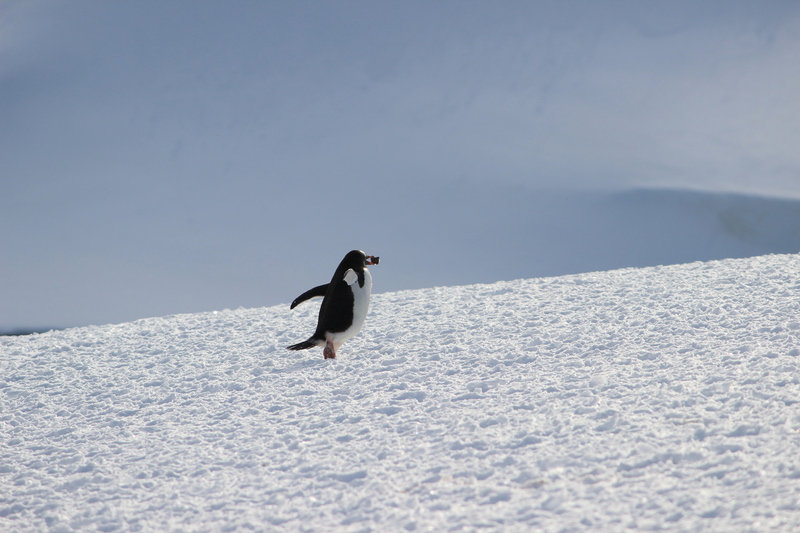 Then I took a picture of the penguin and won the bird jackpot of the trip. An Emperor, completely out of place. Their colonies are in other places on the continent. Birders pay tens of thousands of dollars to see them. 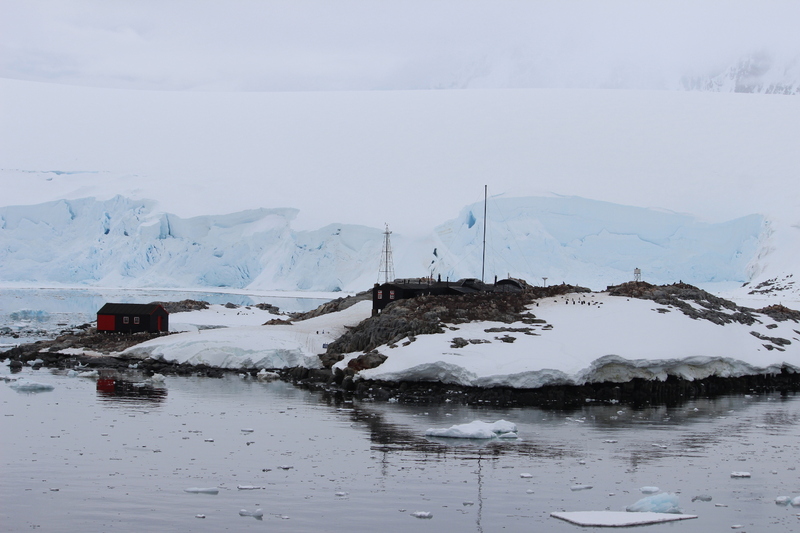 I was the only one lucky enough to take a photo, and shared that on the Fram’s blog: http://mvfram.blogspot.com.ar/2014/12/a-busy-day-at-cuverville-and-almirante.html. There was, however, a lot more to be seen, also some wildlife. 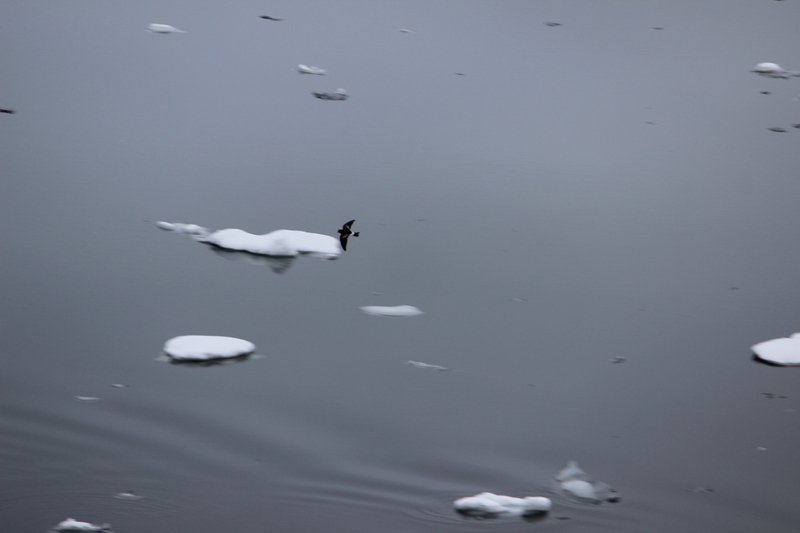 Wilson’s Storm Petrels kept swooping by. 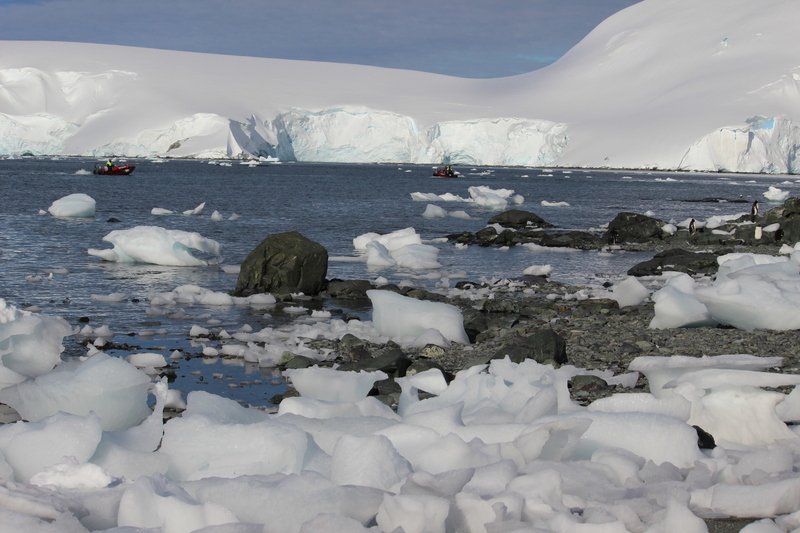 On some bergs, penguins had settled down for a ride (look right). 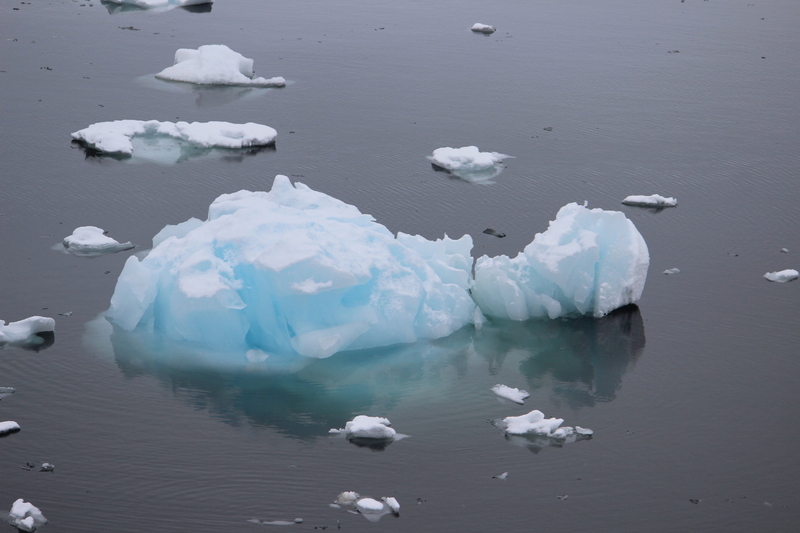 Blue ice could be seen more often. 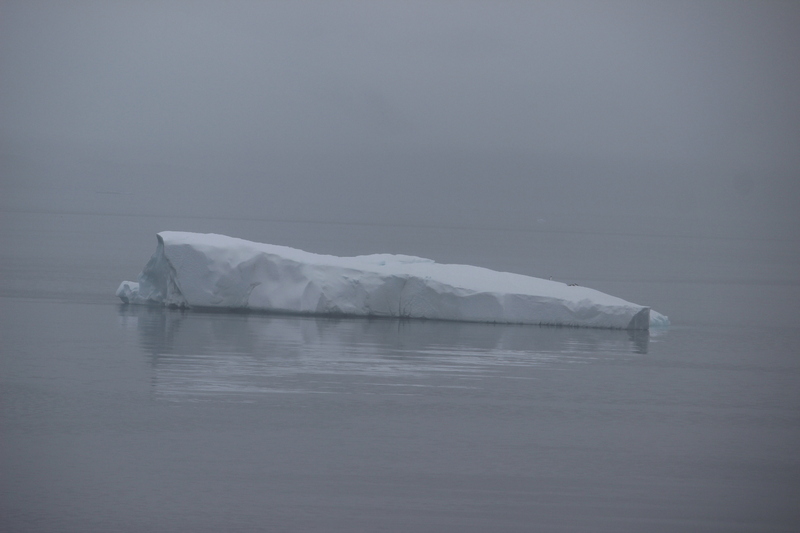 Further afield, big icebergs loomed, and sometimes you couldn’t really tell the difference between them and islands. 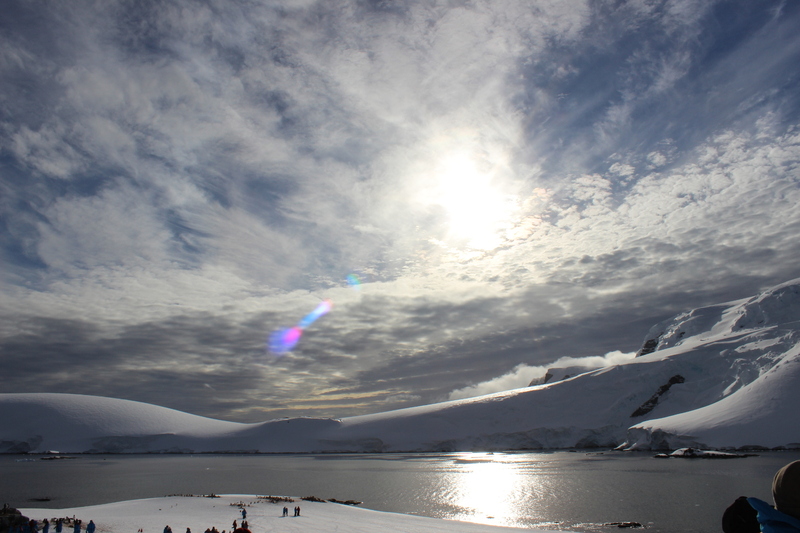 Glaciers were everywhere. 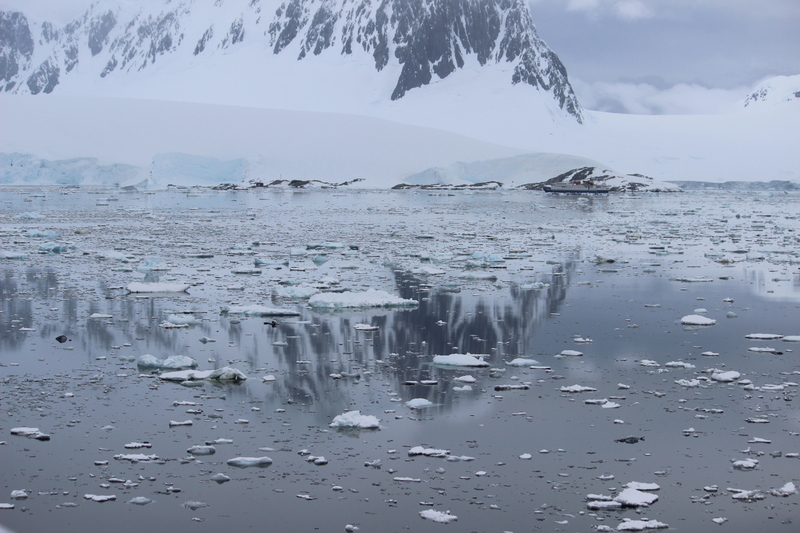 What I found, again, most fascinating were the sections of calm water, where the mountains and the ice mirrored in the sea. Can you find the ship in both photos? 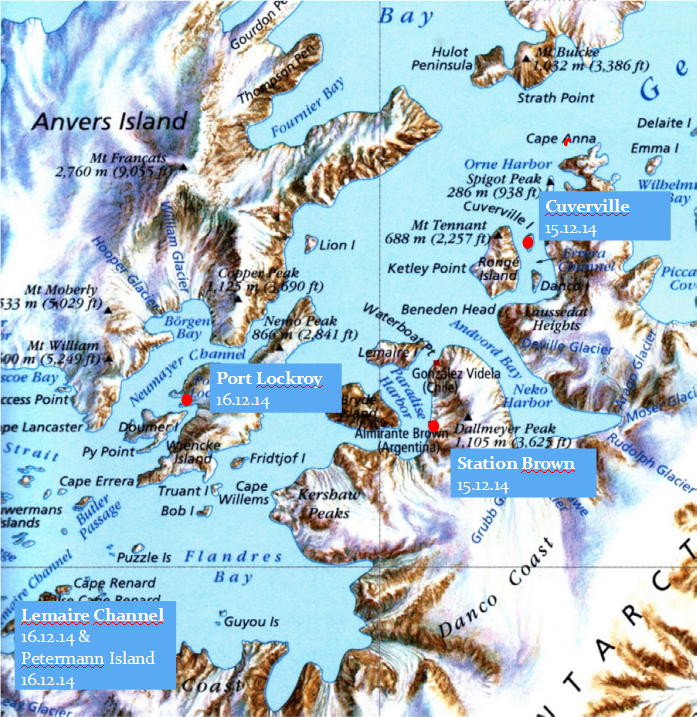 Trinity Island is part of the Palmer Archipelago. 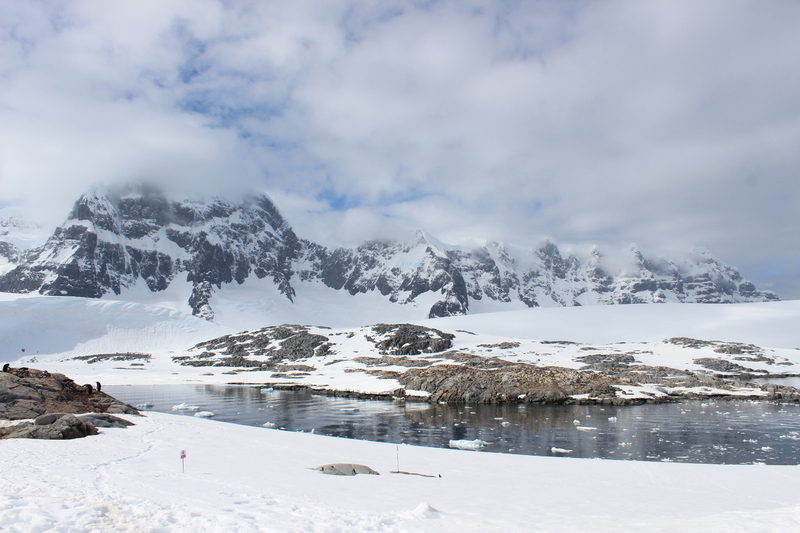 It’s an important breeding area for shags, but we went there to see Gentoo penguins. 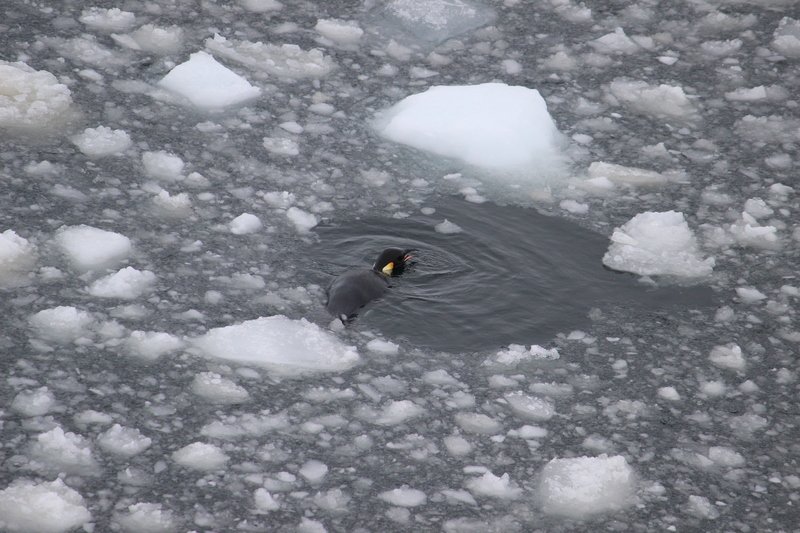 First we had to negotiate a wet landing amongst the ice. Then there was a little hill to be climbed. Not the one in the background. 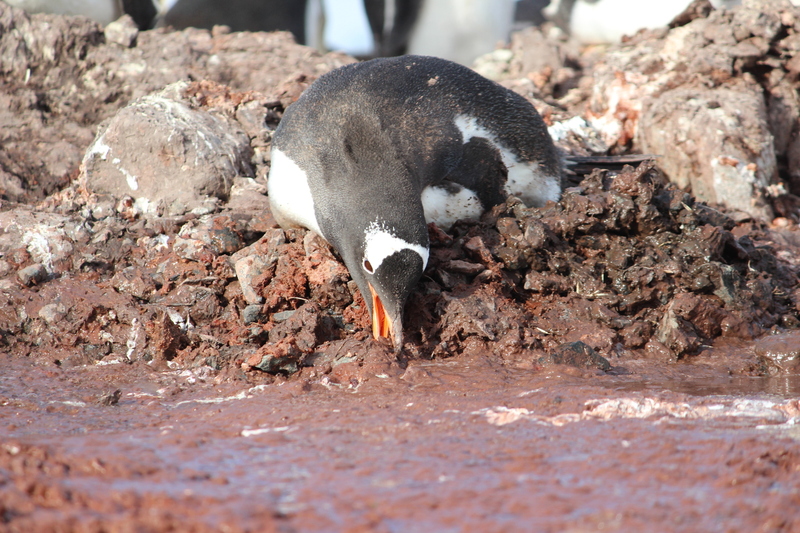 Gentoo penguins, like almost all other ones, build a nest which must be free of ice and water. For this, they need pebbles, and acquiring pebbles is an endless undertaking. 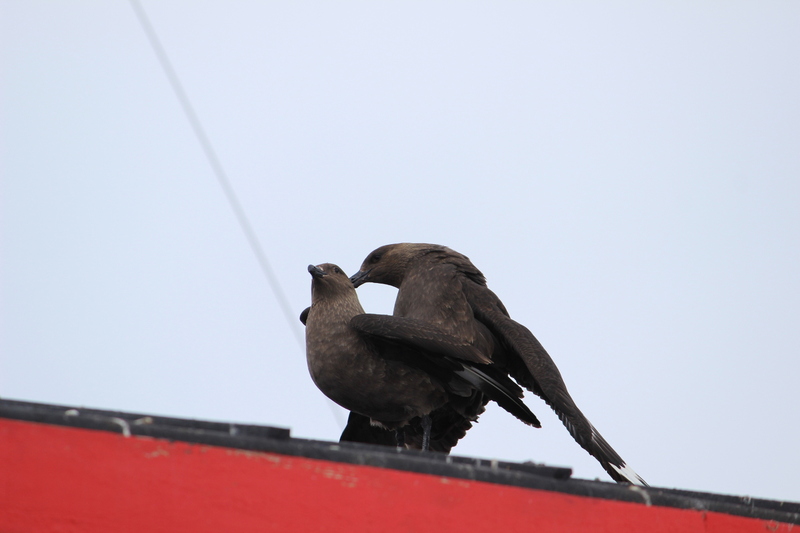 Both males and females sit on the nest, but females have the dirty back from mating. 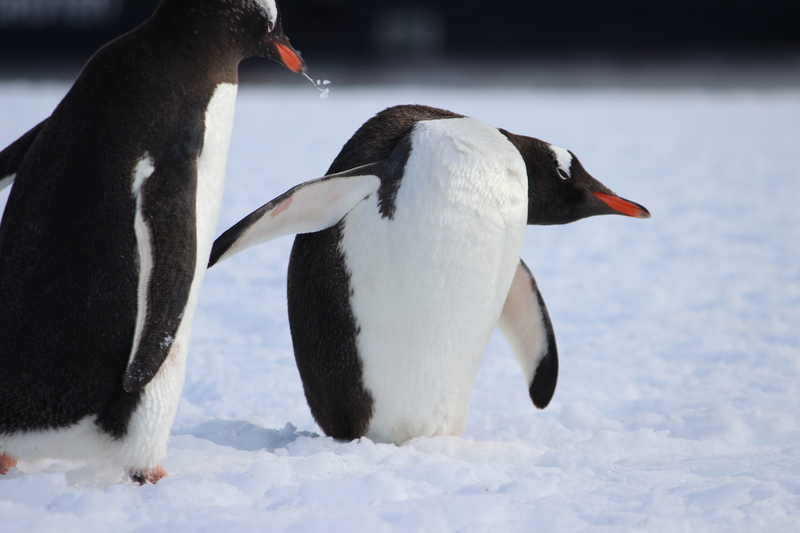 I have never seen penguins spitting before, but maybe someone annoyed someone else by stealing their pebble. 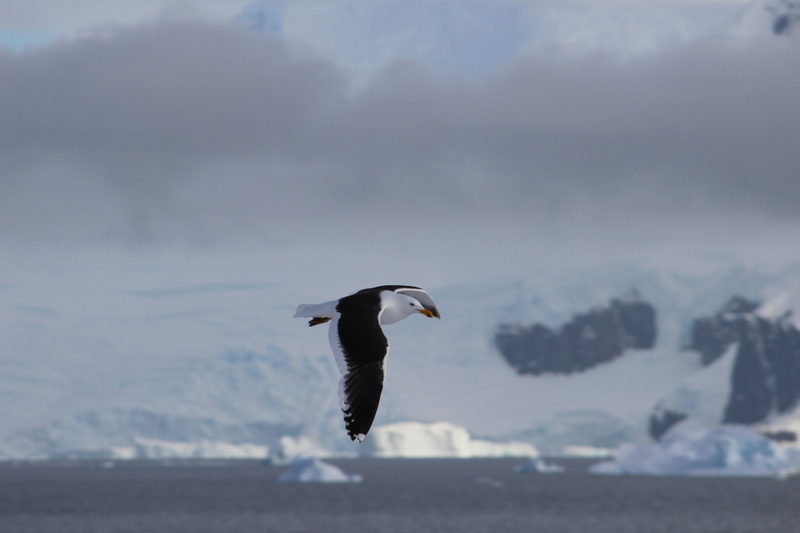 Above all this mayhem, Kelp gulls keep a watchful eye for food opportunities. It was yet another excellent landing.